Previously we had run pictures of Lou Jacobs, Paul Jung and Charlie Bell on boxes of Sugar Smacks in the early half of the 1950s. 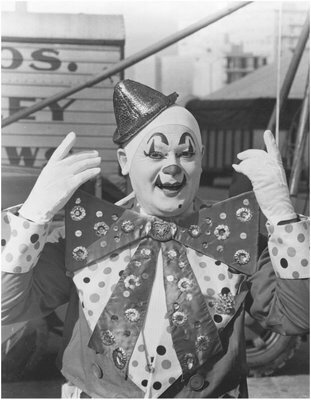 The advertising campaign extended to the clowns' likenesses being featured in commercials done by George Reeves, run during the Kellogg's sponsored The Adventures of Superman. Which begs the question, why wasn't Felix Adler (Ringling's undisputed ace "picture clown") included in the campaign? 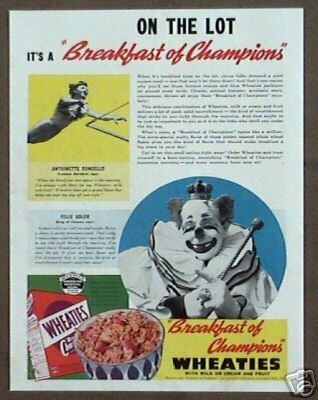 Probably because Felix had been featured on boxes of Wheaties (and to the best of my knowledge the ONLY clown ever to be so honored) a few years earlier. It's Slivers Johnson. Your guess is as good as mine. 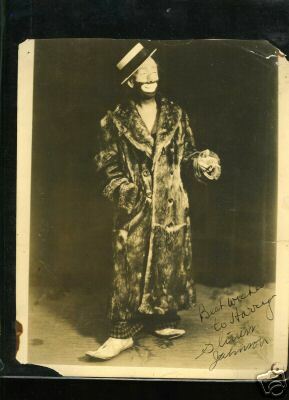 Speaking of Slivers Oakley, I visited the site of the mighty NY Hippodrome today; The very site where Slivers Oakley, Marceline Orbes, Toto, A. Robins, Joe Jackson Sr. & Jr., Poodles Hanneford, Emmett Kelly and Otto Griebling once rolled 'em in the isles. The site of some of Houdini's greatest triumphs. I parked my PT Cruiser right about where the stage would have been. If it's any consolation (and it's not), it's still called the "Hippodrome Garage". Pee Wee Pettee, Cincinnati, Ohio Shrine Circus 1954.
Who says there are no good photos of Otto Griebling and a bassett hound with a hangover?!? Bill Bailey. How sick and tired do you think he got of people singing that song to him, or asking him when he'd be home? Jack Kennedy. With a name like that, I bet this guy worked pretty solidly from 1960 to 1963! 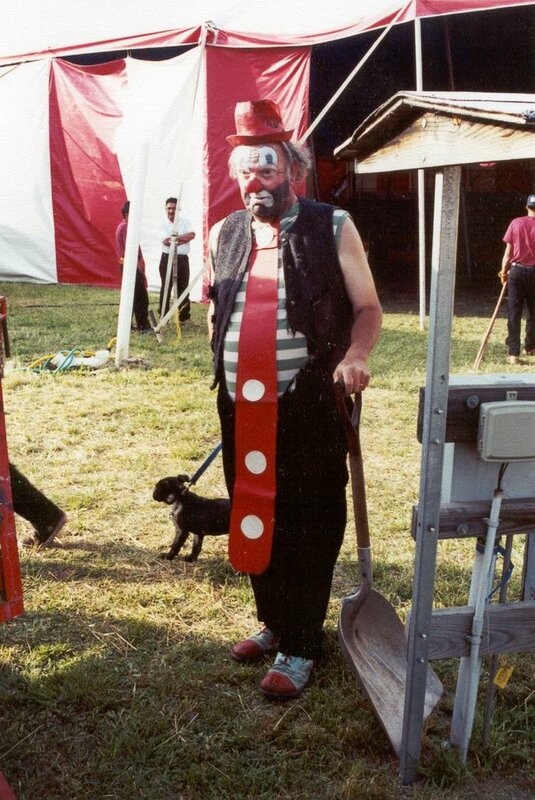 Here is his Dad, "Buzzy", on the LE Barnes Circus in Spartanburg, SC in 2001. Here is Buzzy again, somewhere in Maine, helping my friend Armando Christiani, again on that lone LE Barnes tour of 2001. 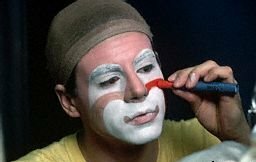 Whatever became of the show's equipment? 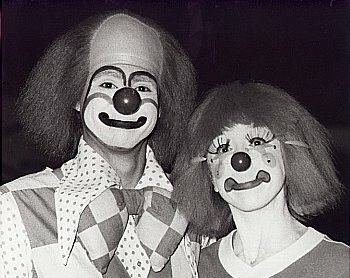 Former Ringling Blue Unit Boss Clown Tom Parrish applying his makeup and posing with his better half, Tammy. 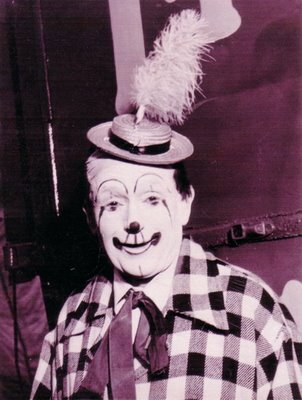 I was told the other day that longtime Clyde Beatty-Cole Bros. Advance Clown and Producing Clown Dean "Elmo Gibb" Chambers and Chris Connors, both currently on tour with the New Cole Bros. 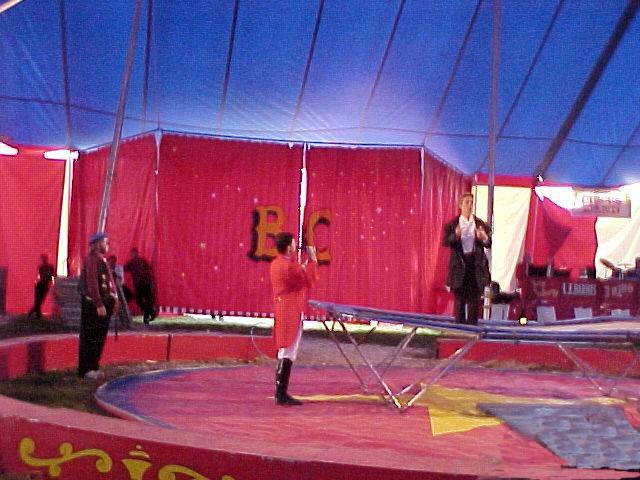 Circus, were looking in at the photos here. 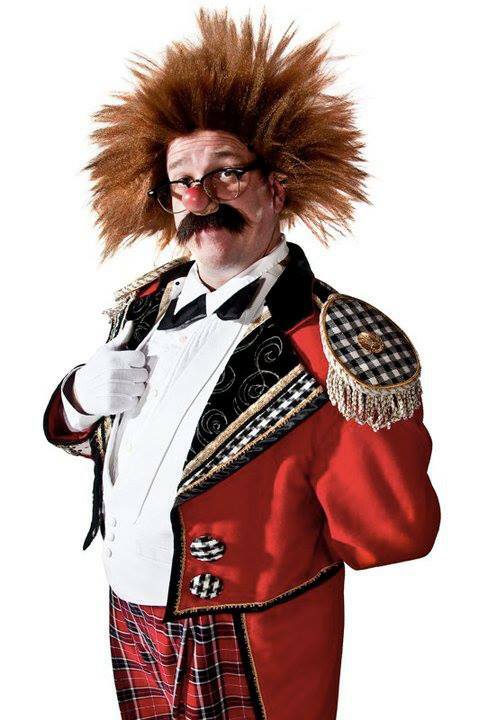 Elmo is back on the road again with his educated ponies and Chris is sharing Ringmaster/Performance Director duties with Ted McRae. 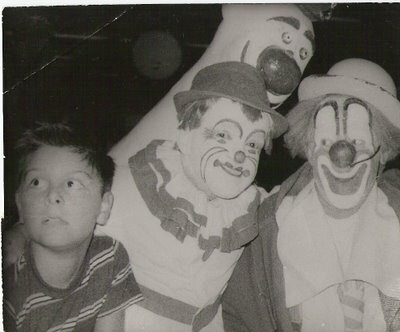 Howdy fellas! For the first time in years I can't wait for the Cole show to make it here to Jersey. 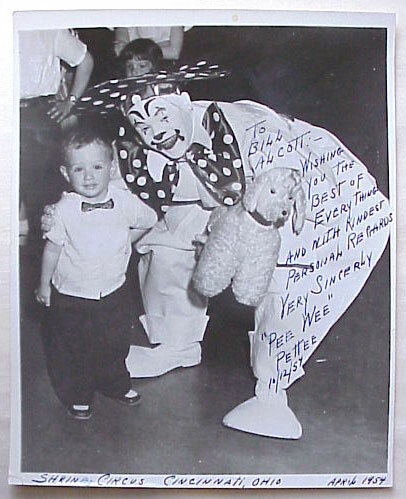 I remember Elmo on the Ringling show when I was young. 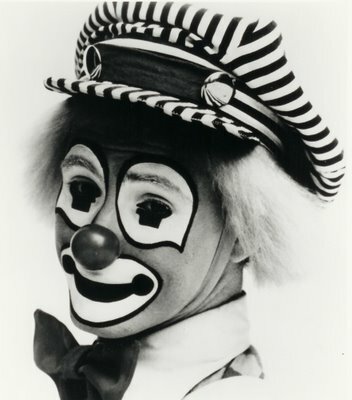 I remember meeting him once in the Brunswick Square Mall just a few years later. 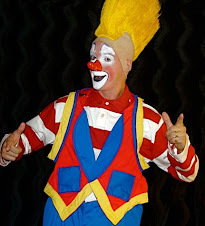 I can't wait to take my son Shane to the show and have him see one of the clowns that I enjoyed watching when I was just a few years older than he is now. YA-HOO! Ladies and Gentlemen, Boys and Girls...WE ARE BACK! The viruses that had plagued both the blog and my computer have been fixed and WE ARE BACK IN BUSINESS! 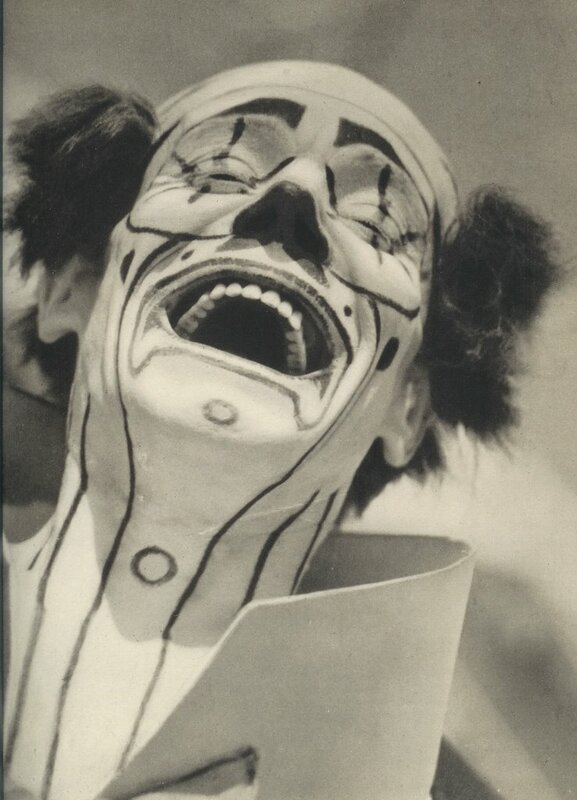 To celebrate, let's all enjoy one of my favorite circus photos of one of my favorite clowns, Chesty Mortimer, taken from Maxwell Frederic Coplan's 1945 book of outstanding photography, PINK LEMONADE. "Chesty, as he is known to all circus followers has been with Ringlings ever since they brought him to the United States a quarter of a century ago. "How's the skating today?" 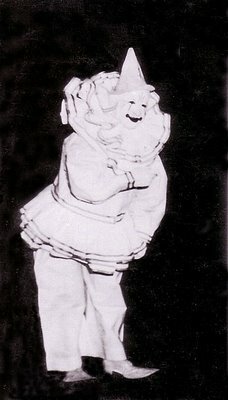 might well be asked of Chesty, as one of his current gags is a glorified Sonja Henie on huge, realistic wooden blades - trugging along on the sawdust. 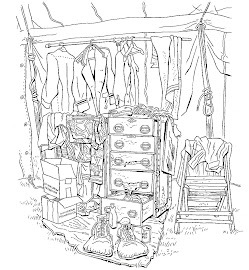 "Things are a little rough, but I'll manage all right, thank you", smiles Chesty a bit breathless, for he is now well past the half-century mark- and you can just bet he will make it for Chesty has overcome many rough spots since he performed in his native Belguim so many years ago. 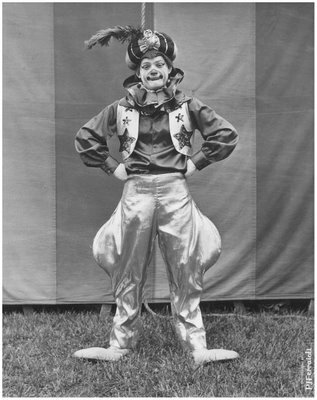 Chesty's big twinkling star-like eyes, wide open mouth and self-erected veins are a delight to the photographers. 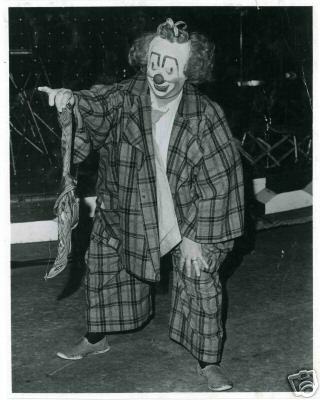 He was a pioneer in the clown boxing field. 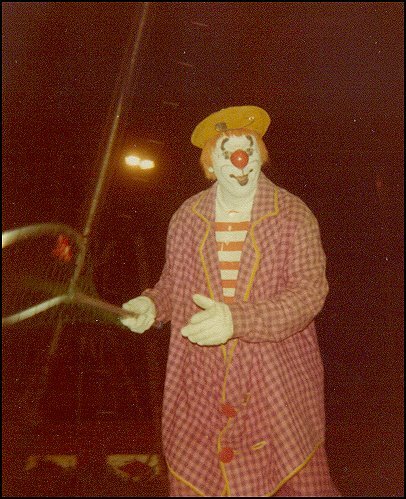 His clowning in sports is a natural, he is still quite an athlete . In recent years he's confined his activities to water sports, especially swimming and fishing, at his Florida home where he goes between seasons." 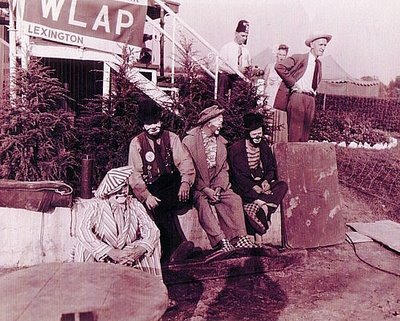 First we have Jojo Lewis with some pals in the backyard of the Ringling show in what looks to be the 30s. 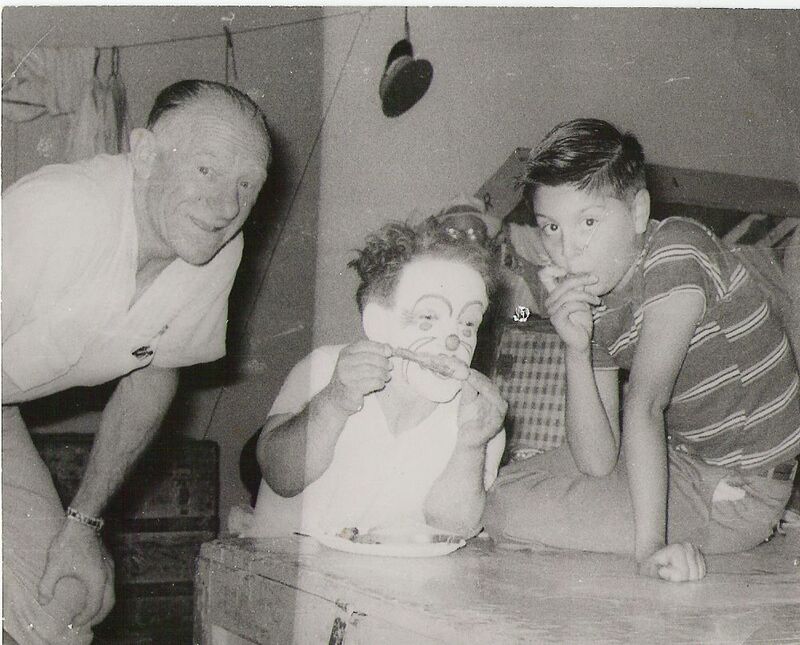 Next up a photo of Lou Jacobs out of makeup, Frankie Saluto chowing down on some free roll chicken and the son of their longtime friend, Iron Eyes Cody. Another photo of Frankie and Lou with Cody's son. 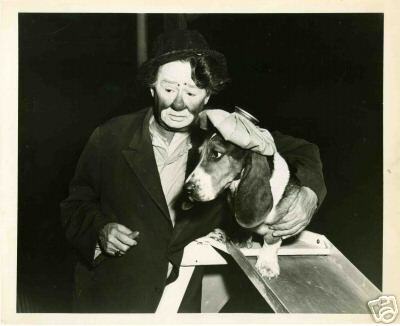 These two photos were taken backstage by Iron Eyes Cody in what looks to be the 1950s. 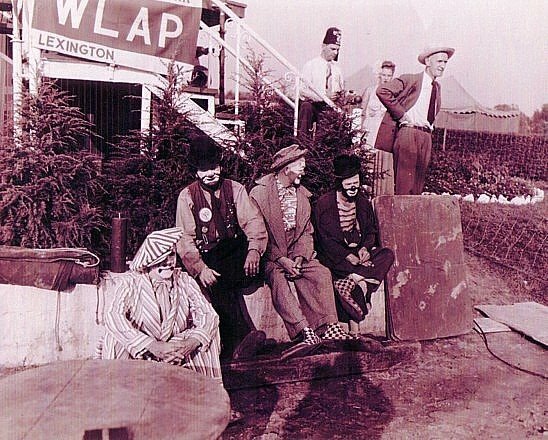 Jack Klipple, Gene Randow, Kinko, & Dime Wilson, and I'll bet Kinko is saying, "why are we sitting here on this wall, we could be in the dressing room playing Pinochle"???? I apologize for the blog being down all weekend. We were hit by an online casino spammer who did not take kindly to my email requesting that he stop. He replied by doing something that killed my computer. So today I am posting from floppy discs that I've taken over to the public library. Today's series of really great late 50s through mid 70s era Beatty-Cole and Ringling photos come to us through the generosity of my new friend, Mr. Bernie Kallman... enjoy. 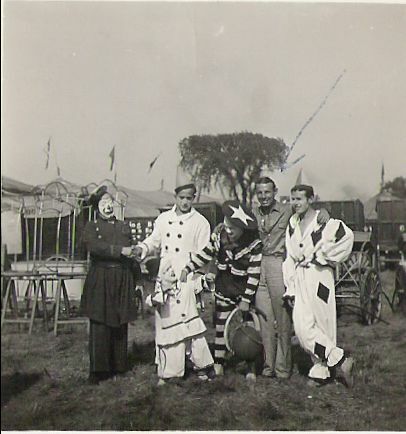 Bernie Kallman and Jimmy James Plott (with an unidentified woman with crazy abs of steel) wearing drag nurse outfits that I've been told were made by the widow of the late Paul Jung. 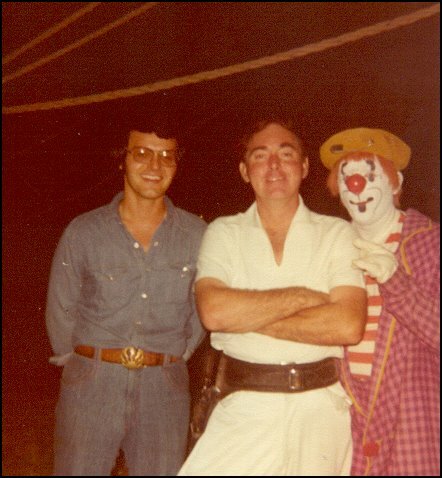 Bernie with two guys. I'm going to guess from the outfit that the fella in the middle is Dave Hoover many, many years before I met him. 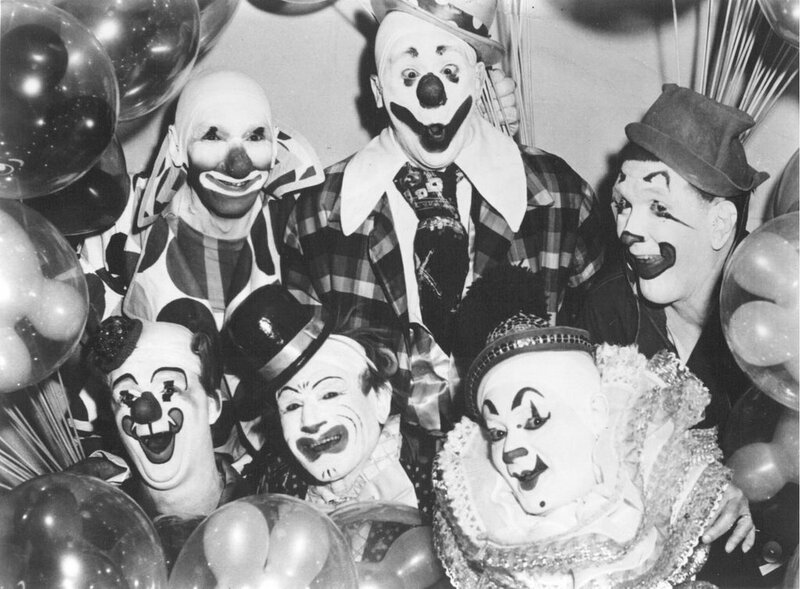 A collection of clowns from the Ringling alley of the late 50s: (clockwise from lower left) Pre-Periwinkle Productions, Circus Report contributor Chuck Burnes, Gene Lewis, Paul Jung, Dennis Stevens, Albert White and , I believe, one of the Nelsons. The one and only...Albert "Flo" White. Someone out there had asked for a photo of Mike Bourbon the other day. Here he is with the lovely Dagmar. This swami is none other than the DONIKERMAN himself, Mike Martin.